Everything Just Sew: Nearly a dress. I couldn't resist checking out how my dress is going to look, now that all six panels are completely finished. Here it is pinned together on my dummy. If you click the pictures for a larger view they should be a bit clearer! I love love love it! I love the weight and drape, the way the surface feels when I run my hands over it, the way it looks - everything! I can't wait to wear it. Even though it's a pretty dressy sort of dress I will wear it any chance I get. Coffee in town with friends is good enough. Possibly so is a trip to the supermarket to get toilet paper. Anything involving the twins and their sticky fingers is NOT! And just for Keely, here's a progress shot of the coat I am making for her. Being a frantically busy post grad student she does not have time to make a wool coat. I really like working with lovely wool, so I said I'd make it for her. In exchange she keeps me supplied with peanut butter based chocolate confectionery. Good system! This is the pocket opening, which is set into a side seam. 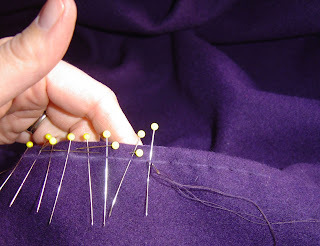 I am pick stitching the opening to hold everything flat, and add a subtle detail. The chalk line and wonky looking pins are marking where each stitch goes (where each pin goes into the fabric is actually even, but boy they look wild in this shot!). After the chalk is brushed away it looks really nice. Keely, your lining is still evil. Just so you know. The dress is looking very pretty! And the pocket looks cool. Now I feel even guiltier fr eating that last block of peanut butter choc. As for the lining, I'll bring some more choc over and we could try an exorcism? Love it ... Looks gorgeous!